In the Spring of 2002 the LDS Church completed its reconstruction of the Nauvoo Temple in Illinois. It was originally built in the 1840's but was destroyed after the Mormons abandoned the town. Due to the publicity and photos regarding this new temple many people have asked about the symbols on the building. 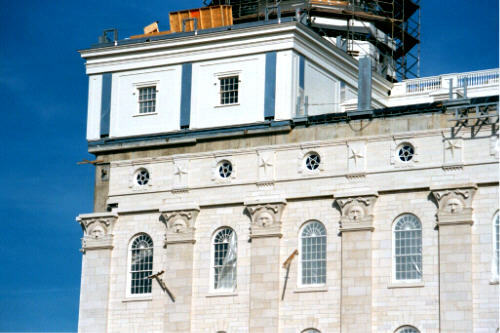 "Every detail of the historic Nauvoo Temple was reconstructed [in the new Nauvoo temple] meticulously with one exception: the flying angel weather vane that graced the top of the 19th century Mormon edifice. 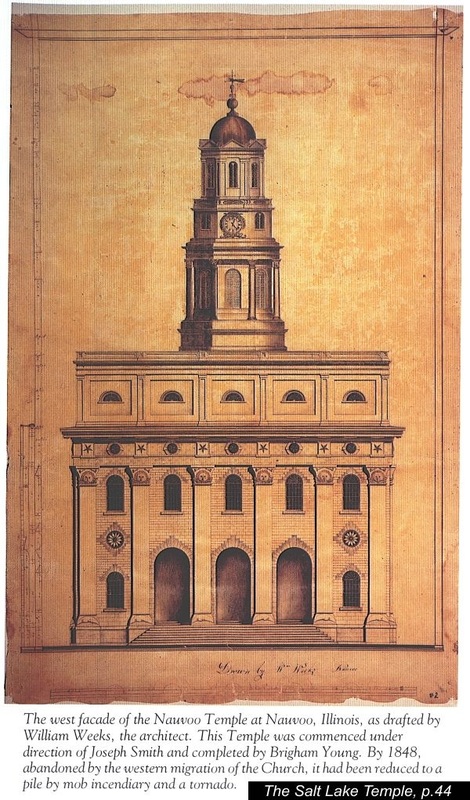 Original architect's drawing of the Nauvoo Temple weather vane. Notice the compass and square above the angel. 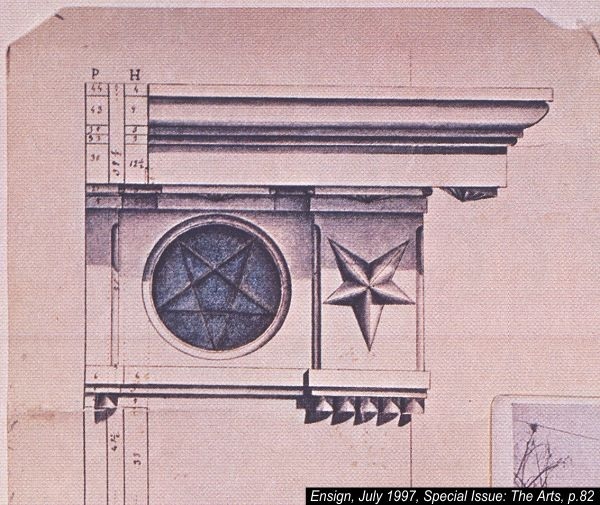 Architect's drawing of the stars for the Nauvoo Temple. The compass and square as used in Masonry. Additional details of the Nauvoo temple symbols and pictures of the building are in the Deseret News 2001-2002 Church Almanac (see pp.120-141). 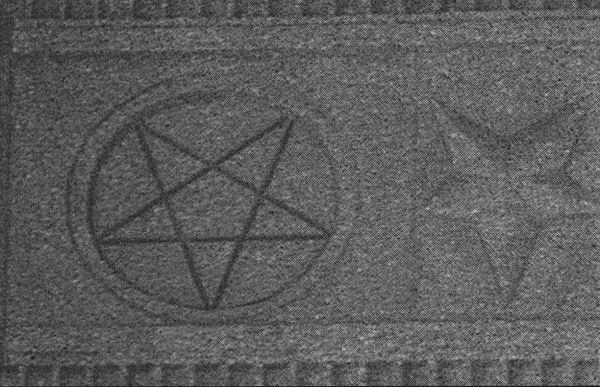 On page 135 of the Almanac is a photograph of one of the original sunstones that were placed at the top of the columns around the outside of the temple. 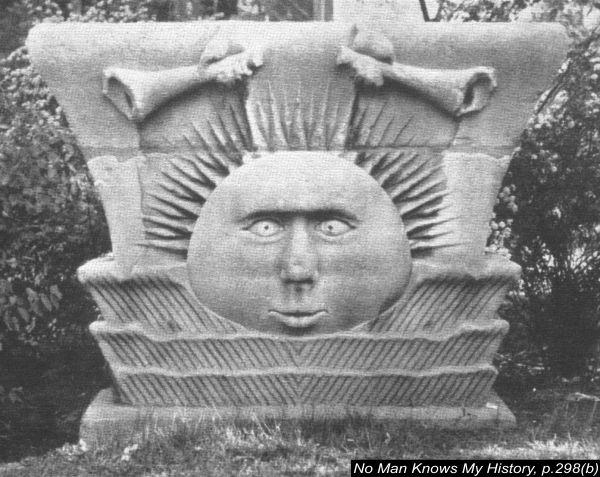 A photo of a sunstone is also in Fawn Brodie's book, No Man Knows My History, p.298(b). 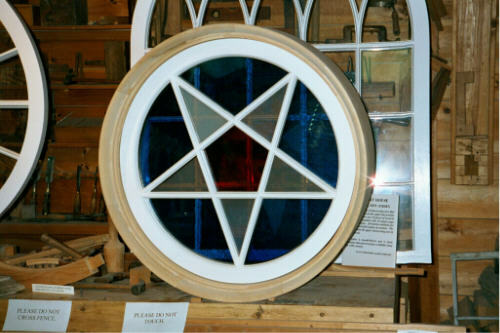 One of the original sunstones from the Nauvoo Temple. Masonic symbols have been pictured and discussed in a number of books. Albert Pike, in his book, Morals and Dogma of the Ancient and Accepted Scottish Rite of Freemasonry, discusses the various Masonic symbols and their meaning. In the book The Craft and Its Symbols: Opening the Door to Masonic Symbolism, by Allen E. Roberts, p.11, is a drawing of the Masonic apron presented to President George Washington by Lafayette The symbols on the apron, which were later used by the Mormons, include a beehive, all-seeing eye, compass and square, and the sun, moon and stars. 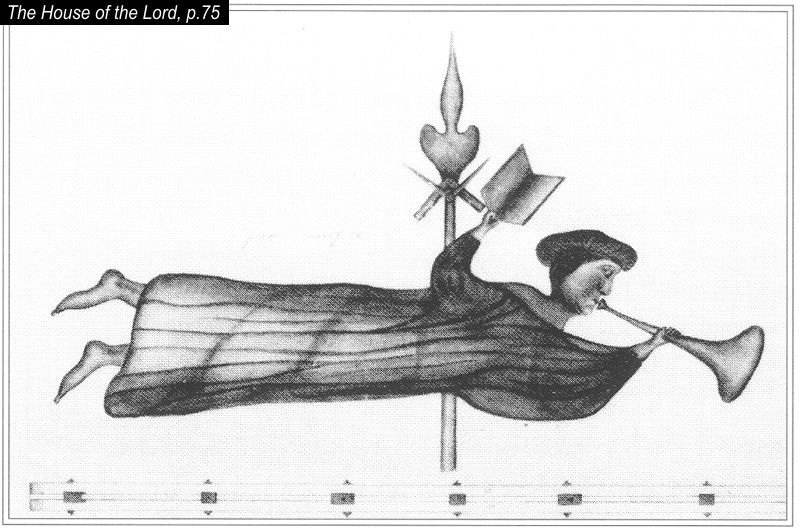 The Masonic Monitor, in 1820, had an illustration of the symbols of Freemasonry. This drawing is very similar to Washington's apron. 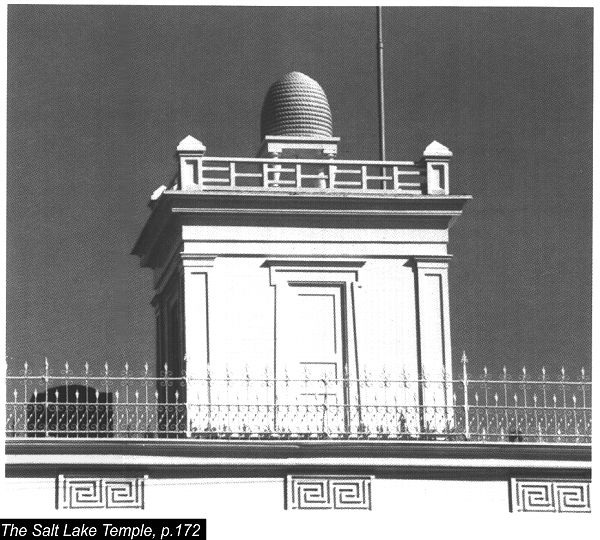 Many Masonic symbols (the sun, moon, stars, all-seeing eye, beehive, hand grip, and the beehive) were also placed on the Salt Lake Temple. 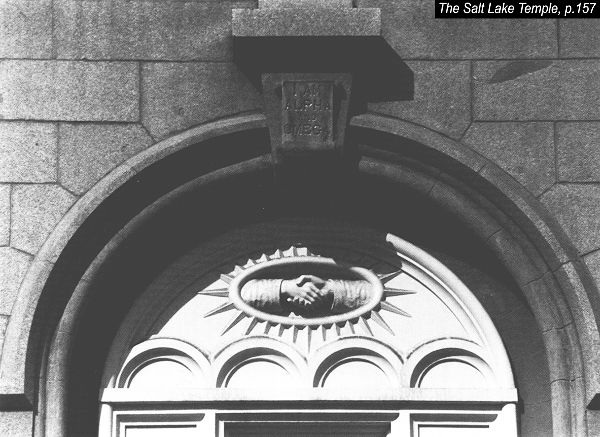 Symbols on the front of the Salt Lake Temple. One of the more familiar symbols of Mormonism is the beehive. 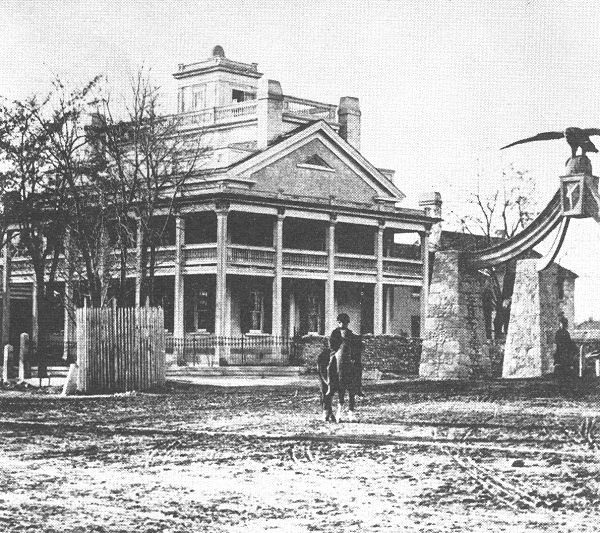 Examples of pioneer use of the hive can be seen on Brigham Young's home (known as the Beehive House) in Salt Lake City. 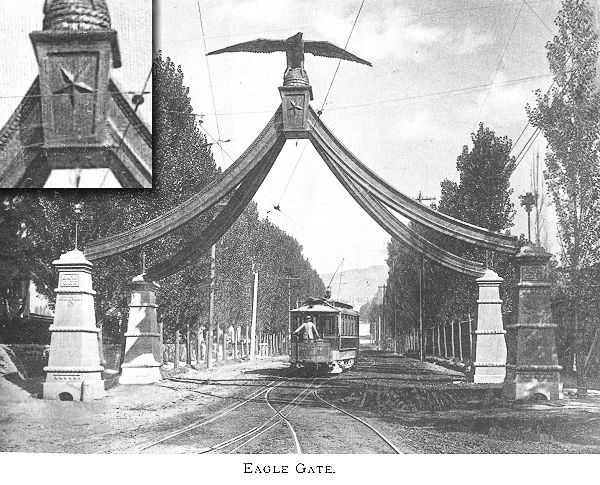 Beehive House with Eagle Gate next to it. 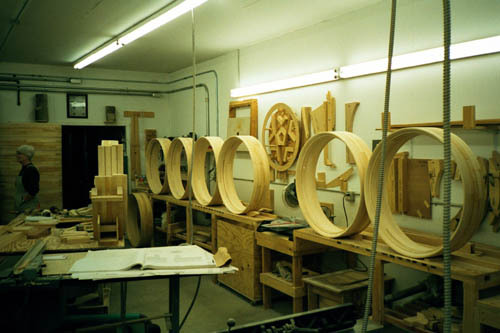 The beehive is also displayed on the doorknobs of the Salt Lake temple. One of the brass doorknobs in the Salt Lake Temple displaying the beehive. 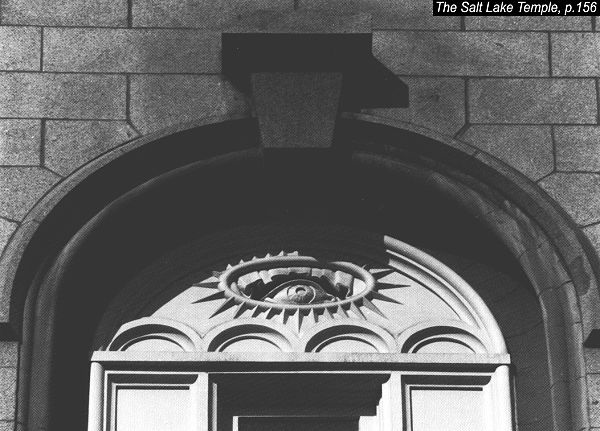 While many people are aware of the symbols used on the Salt Lake temple, they were also used on other LDS buildings in Utah (see "Where Are All The All-Seeing Eyes? ", Sunstone Magazine, vol.10, no.5, May 1985). 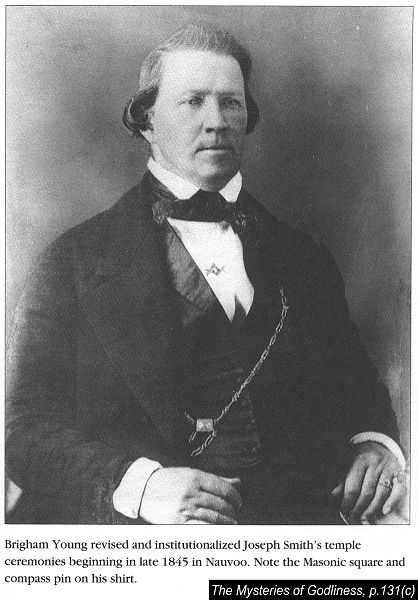 Even after the Mormons came to Utah, Brigham Young continued to wear his Masonic pin displaying the compass and square. 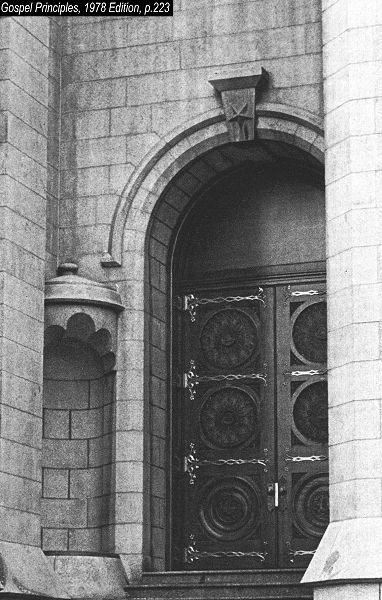 and on the front entrance, upper left-hand corner, of the LDS Historical Museum (west of temple square). 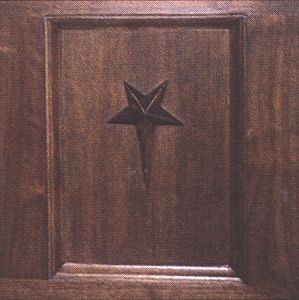 While the upside-down star is used in Masonry, it is also used by Satanists. Also, on the LDS temple undergarment (worn daily by LDS faithful) are embroidered the compass and square. This would look like small zigzag stitching to form a "V" on the left breast and a "L" on the right breast of the garment. There is also a small stitched line at the bellybutton and the right knee. These are on both the men's and the women's underwear. The garment is to be worn daily to remind the Mormon of the covenants made in the temple. Since the LDS Church rejects the use of the cross as a religious symbol, one is left to wonder why they would adopt symbols used by the Masons and Satanists? 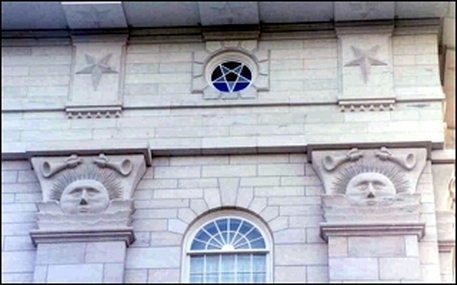 "Masons who visit the Temple Block in Salt Lake City are impressed by what they call the Masonic emblems displayed on the outside of the Mormon Temple. "Yes, the 'Masonic emblems' are displayed on the walls of the Temple—the sun, moon and stars, 'Holiness to the Lord,' the two right hands clasped in fellowship, the All-seeing eye, Alpha and Omega, and the beehive. Masonic writers tell us that the Mormon Temple ritual and their own are slightly similar in some respects. Since Freemasonry dates to the 1700's and Joseph Smith was a Mason before he introduced the LDS temple rituals and built the Nauvoo temple, one is forced to conclude that the similarities between the two groups are due to Smith borrowing elements from Masonry. For more information see our page: Captain Morgan and the Masonic Influence in Mormonism.